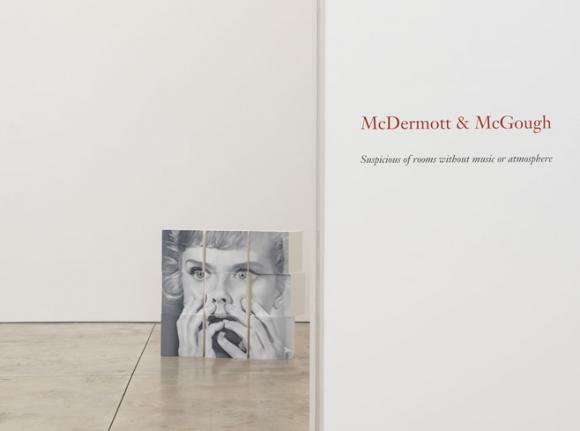 Cheim & Read is pleased to announce an exhibition of painting, sculpture and works on paper by the collaborative duo McDermott and McGough entitled Suspicious of rooms without music or atmosphere. The show will be accompanied by a full-color catalogue. David McDermott and Peter McGough (born 1952 and 1958 respectively) attended the University of Syracuse in the 1970s. In the 80s, the two were known in New York City’s East Village art scene for their self-immersion in the Victorian era, their lives and art strictly defined by the early 1900s. Through this time-based “portal,” McDermott and McGough challenged the chronological boundaries of art history and cultural identity. They questioned the nature of nostalgia and narrative, and the ways in which the past is conceptually and contextually reoriented for the future. The subsequent evolution of their work has found them more recently inspired by Hollywood cinema, advertising tropes, and comic books of the 1950s and 60s – the duo again searching for identity within an artificial world. In their current exhibition at Cheim & Read, focus resides in images of self-introspection and human emotion: scenes which emphasize the absurdity and cruelty of life’s journey are at the forefront. Several photo-realist paintings juxtapose carefully selected movie scenes in which a decisive moment is central. The paintings are generally composed of two separate “images” from different movies, one black-and-white and one color, allowing for new and alternate readings of existing narratives. Rendered on a two-dimensional surface, the scene’s original context is frozen, its meaning repositioned. While the female protagonist is often a recognizable actress (Elizabeth Taylor, Lana Turner, Lauren Bacall, etc. ), McDermott and McGough deny the importance of this factor – they look instead for expressions which convey emotional impact. Scenes in which a choice must be made or has just been made are especially tension-filled, and the resulting paintings become emblematic of this internal drama. Within sumptuous, well-appointed rooms – “manufactured” by Hollywood and echoing the commercial artifice of our own lives – lone female figures are ensnared by the consequences of their decisions. An ashtray and empty bottle are symbolic of lost youth; a desolate train station is a metaphor for dashed dreams. Accompanying works on paper for the show evolved from the paintings, and contrast the latter’s careful realism with a looser hand. The images – painted gouache on top of ink jet print-outs – also begin with a crucial cinematic moment, but are elaborated upon with faceted, brightly colored, almost psychedelic shapes. The execution of the flatly-painted forms, though focused, is organic and abstract, echoing and affirming the psychic fragmentation of the characters depicted. A sculptural work – all painted wood – brings this fragmentation into another dimension. In the piece, 9 boxes, all one-foot square, depict a terrified face (Anne Francis in the Twilight Zone). The shock conveyed by her expression is reiterated by the physical fracturing of the image, and the possible variations implied by its separate parts. While the comedy of the drama is not lost on the artists, McDermott & McGough ultimately strive to reveal complex psychological portraits. They are fascinated by the impact of one’s choices in life and the quick disintegration of well-laid plans after a bad turn. The fragility of existence – the unfairness and perversity of life – in part defines the search for self. McDermott and McGough’s continued appropriation of popular imagery underscores their work’s themes and re-engages ideas of time and memory. By using Hollywood films as their subject, they start off with archetypal notions of beauty and desire, and thus comment on the cultural and consumerist constructions of our own identities. The emotional self requires deeper introspection. In a room without music or atmosphere, we are left in solitude; without distraction we face ourselves.